Your name is Hasbro and you own the rights to a well-known board game, centered about guessing where the opponent's ships are. What do you do? Naturally, you let Universal turn it into a blockbuster marketed to look like Michael Bay's Transformers, incidentally surprising people with a dumb action movie that ends up being much more entertaining than it has any right to be. Then you let EA obtain the rights to the board game to turn it into a mobile title, while you hand Activision the rights to create a first-person console shooter based on the movie. Activision then puts Double Helix on the job, since they were so successful with games like G.I. Joe: The Rise of Cobra and Green Lantern: Rise of the Manhunters. Meanwhile, Activision omits to put "Rise" in the title, despite this being the one property where it would be suitable. When it comes to the chronicled history of movie tie-in video games, it's going to be hard for anyone to top the ridiculous case of Battleship. The first words you hear upon starting the game is "Master Chief!" as our protagonist, Explosive Ordnance Disposal Officer Mathis, wakes up from a Hawaiian nap, right next to a tent where he could've easily napped in greater comfort. Perhaps this is what makes him Chief Petty Officer, but such existential plights are never explored. Before long, a freedom-hating alien force invades the archipelago because this is the world of Battleship, and Mathis finds himself shooting at what look like the enemies from Haze for the glory of the United States Navy. 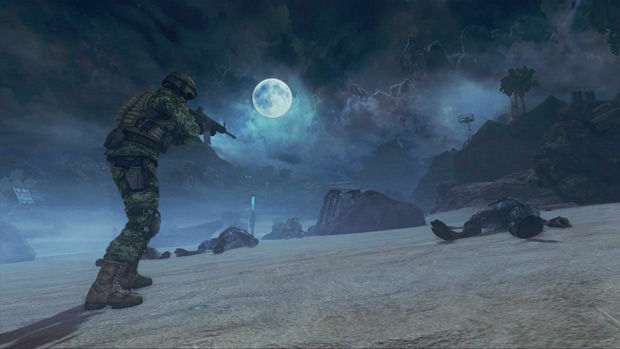 Alien baddies come in three varieties -- soldiers, melee brutes, and snipers -- while the armament with which to dispatch them consists of a pistol, assault rifle, shotgun, and an alien gatling gun and sniper rifle. Sniper aliens are best shot with their own sniper rifle, brutes can be staggered with a shotgun while they'll destroy you if you forgot to pick one up before the last checkpoint, and that's the level of tactical complexity the shooting mechanics have to offer. Although Battleship doesn't let you play through the exact events of the movie -- it would involve a lot of sitting on a ship and shouting if it did -- it shares enough similarities to serve as a parallel storyline. Among these similarities are not only the Hawaiian locales, lots of water, and things that go boom, but the ability to command a small fleet of different ships through a system called "Battle Com." 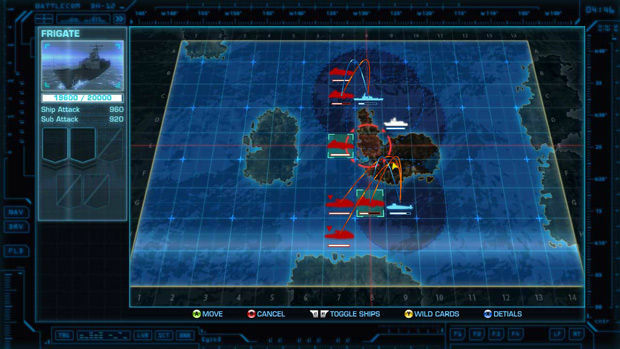 After pressing a button to load it up for what seems like a inordinate amount of time for what you get in return, a 2D grid-based map of the island area is displayed, with allied and enemy vessels occupying various locations. While shooting up the tsunami of aliens on the ground, Mathis can find Wildcards -- upgrade cards -- to use in Battle Com. This allows you to add more attack power, range, or survivability to your individual ships, which in turn can be assigned to move to and attack locations on the grid. One of these Wildcards allows you to take control of any vessel for 20 seconds, leading to a minigame of mashing triggers and shoulder buttons to offload as much ordnance as quickly you can; a maritime masturbation minigame if you will. The best part of this minigame is that even if one ship is on the complete opposite side of an island, it will be magically transported right next to the enemy vessel for this minigame, before being teleported back to its original position in Battle Com. To fully simulate the elegant dance of close quarters naval warfare, torpedoes can be shot sideways from a submarine at any angle. Video games. Certain squares on the grid double as support locations; move a ship onto one of these locations and you'll be able to call in various support strikes depending on the vessel you assigned to it. Artillery barrages, missile strikes, and stun decoy drones allow for a slightly more tactical approach on the ground, although you won't ever need them to survive even the hardest difficulty level. As nice as it is to continuously see the real-time naval activities take place in the background of the first-person action, offering a good sense of scale to the steel behemoths, it can lead to some oddities. When ships move to locations close to dry land, awkward situations arise when a battleship ends up next to a cliff or a beach in shallow water, and sometimes goes right through the island geometry because these vessels are simply so powerful that they have an innate desire to break the shackles of stupidly restrictive physics, and seek true freedom 30 feet inside a hill. Things like this could be excused if there wasn't a USO banner on the game's official website, or a United States Navy recruitment video in the Extras menu, or even descriptions of naval vessels and combat roles which spout family-friendly terms like "power projection" and "multiple-target response capability." When a video game almost feels like an advert for one country's naval forces, you can expect it to at least have ships that act like ships, and not the kind that just casually cruises up a beach in search of prime real estate. 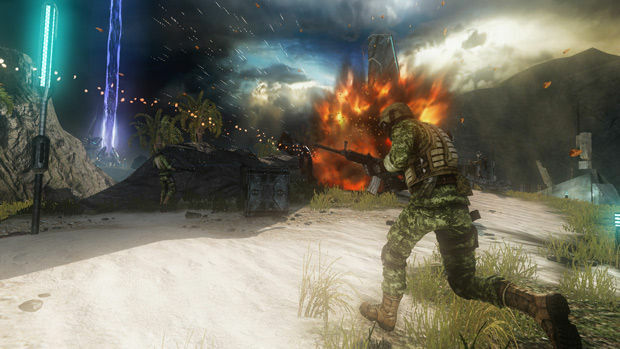 The seven levels of this singleplayer-only title aren't very expansive, turning missions into sessions that take up to 30 minutes to navigate depending on the difficulty setting. Try to unlock all of the achievements and trophies, and a frustrating final section on the hardest difficutly, as well as a bit of grinding for specific kills, might double that playtime. 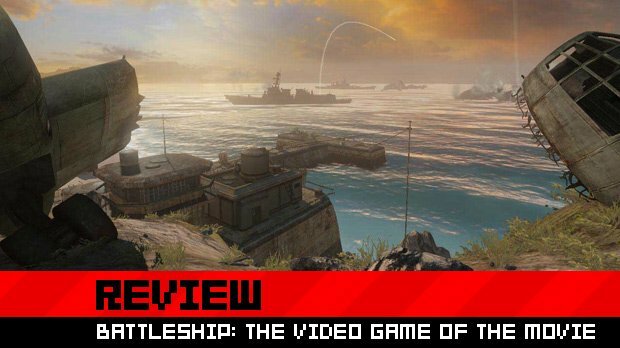 Surpringly enough, however, Battleship may not shine in terms of longevity or innovation, but it is in many regards the quintessential mediocre shooter; the kind you can use to completely forget about anything else for a few hours, with not a care in the world. The shooting mechanics work well enough for it to be mindlessly enjoyable, despite the idiotic enemy AI restricting it to only the most minor of flanking maneuvers and weird crouching animations when you land a few hits on the alien soldiers. Put aside the movie tie-in goggles, and the pacing and combat encounters reveal a dormant promise buried beneath it all. Meanwhile, the naval warfare aspect isn't great or deep, but it surpasses the bare minimum of fun you would expect from such a mode. It's a shame that the fluidity of swapping between the two modes suffers from a high viscosity, turning what could have been a form of dynamic action into an affair that is often disruptive to its flow. A look at the concept art included on the disc also provides some insight into levels that did not make it to the final game, showing a hint of Double Helix's intent to make the best of the what they were given. Sadly, it seems the studio was ultimately unable to deliver on what potential there was, or to go overboard with it. 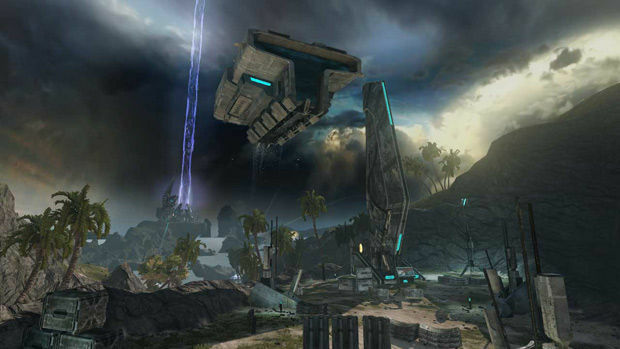 Settings such as an island resort and a deserted theme park, the landing of an alien invasion force, lava-filled and storm-drained islands, and high-octane action on the ocean itself are nowhere to be found in the actual game. Whether this was due to publisher pressure or simply a result of having reach the milestones required to ship it alongside the theatrical release, looking below the surface reveals a developer that may surprise us yet -- perhaps provided they won't have to go upstream to deliver under constraints the next time around. What does this game have to do with the original Battleship, then? For starters, hidden Pegs can be found on the tiny levels. That's right, the little pins you put on your board in the classic Battleship game. Some types of alien vessels launch batches of time-delayed grenades that are shaped like pegs, similar to the ones seen in the movie where they are used to sink human destroyers and cruisers. The grid of Battle Com has numbers and letters for the player to shout out locations without anyone hearing (hopefully), but that's where the comparison to the source material ends. What is left is a title that isn't truly good or bad, with aspects that can be fun at times yet which grow boring over the course of its 4 hour lifespan, and ultimately it falls just short of being anything more than decidedly average. 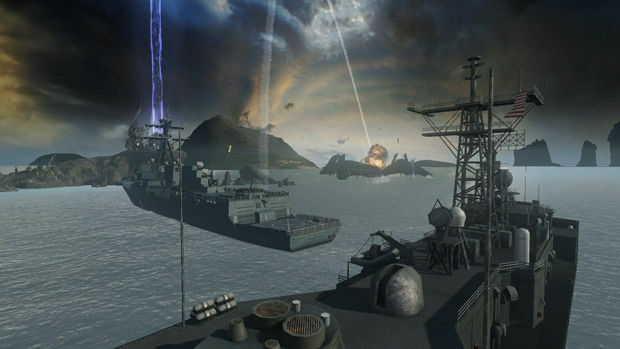 Battleship is neither the kind of hit that would wow anyone at E3, nor is it the best gift for a D8, but even though it doesn't offer anything you haven't seen B4, there's little here to H8.